Augsburg Theater Department presents an adaptation of Shakespeare's A Midsummer Night's Dream Student Directed by Kat Lutze "Lord what fools these mortals be!" Join Puck and his fairy friends as they stumble upon a bunch of foolish mechanics rehearsing a play. Musical mayhem ensues as the trickster fairy uses his magic to interrupt their clownish play acting. Inspired by the original Midsummer, the cast and crew will create songs, music, and dance to stage a totally unique and fun-filled piece of theatre. In preparation for their upcoming tour the choir will perform at Mount Calvary Lutheran Church (301 County Rd. 19, Excelsior, MN 55331, church phone 952-474-8893). Free will offering taken. The Augsburg College Native American Film Festival and various academic departments are proud to present a three-night film festival celebrating Indigenous film, collaborations across national boundaries, and visual storytelling. 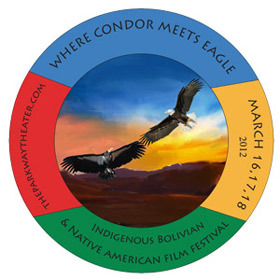 The festival title, Where Condor Meets Eagle, reflects the prophecy that when the Condor (Bolivia) meets the Eagle (North America) the Indigenous continent will be healed. This title also represents our philosophy to promote good health/living well for Indigenous communities through decolonization and self-determination. The film festival includes documentaries, docudramas, and narrative fiction films representing the work produced by three Indigenous film organization Igloolik Isuma Productions (Canada), CAIB (Bolivia) and Mushkeg Media Inc. (Canada) whose award winning work has been recognized globally at festivals including, the Native American Film + Video Festival (New York), Cannes, Toronto Film Festival, and the American Indigenous People and First Nations Film and Video Festival (Bolivia). The event also will include short films produced in the Summer 2011 by two award winning local youth-producer groups from Minnesota: MIGIZI Youth Producers and Project Reserve Youth Producers. Many of the filmmakers will be present at the screenings to answer your questions and participate in discussions about their films, Indigenous culture, traditional worldviews, and contemporary issues facing Indigenous people. The three evenings will each have a theme: Language and Culture, Contemporary Issues, and Traditional Stories. Translators will be present at each event. See the website for program details including summaries of the films and start times (summaries are taken from Native Networks website unless otherwise noted). All films will be subtitled in English.